Caves – underground crevices and cavities that develop naturally over millennia, usually due to erosive underwater action or the slow erosion of dripping water – keep hidden the natural beauty and splendours of the world; their breathtaking formation or cultural relevance uncovered by scientists or explorers and later shared with visitors. Their importance, or simply their majesty, an echo of the people or creatures who have celebrated, lived or sheltered against their porous walls and floors. At the very tip of the African continent, Blombos Cave is one of the country’s most famous caves. Within its walls perforated shells (personal ornaments or jewellery) were uncovered that appear to have been strung as beads some 75 000 years ago. Prehistoric rock engravings found in the cave are the earliest known prehistoric art in Africa, dating back to the Mousterian period of the Middle Paleolithic era – amongst the oldest Stone Age art discovered on the planet. 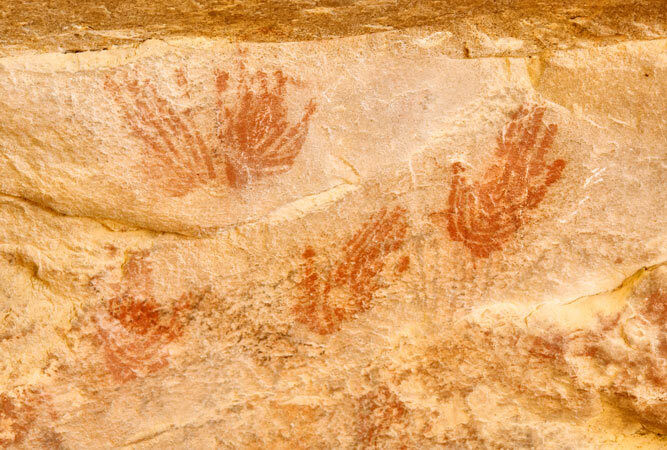 But the discovery is all the more magnificent for the paint kits (yellow and red pigments, shell containers, grinding cobbles and bone spatulas) that prove that our early ancestors were capable of complex thought. Researchers believe that these discoveries indicate that modern human behaviour can be traced back to Southern Africa. Visit the Blombos Museum of Archaeology in Stilbaai to see bone tools, freshwater shells used as beads and replicas of the engraved ochre and 100 000 year-old paint kit. 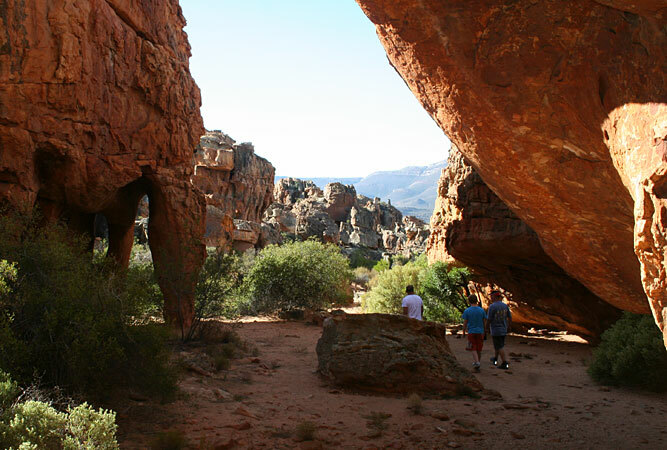 These Precambrian limestone caves lie in the foothills of the Swartberg Mountains close to Oudtshoorn in the Karoo. 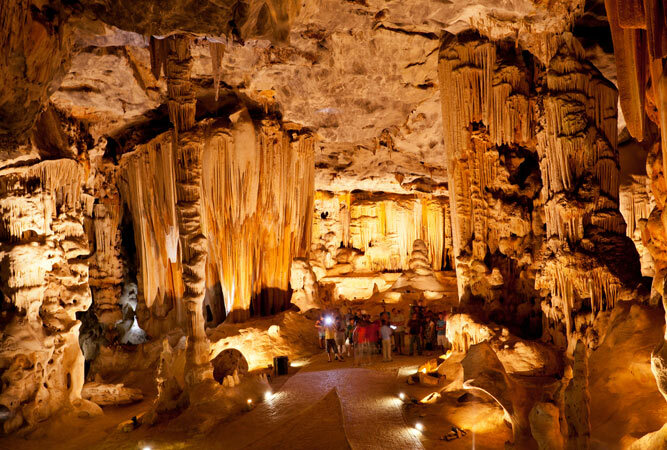 One of South Africa’s most celebrated caves they are a series of dripstone caverns that open into vast halls of immense stalagmite and stalactite formations. In total they are a huge system of tunnels and chambers that go on for four kilometres, but only a quarter of this is open to visitors, in particular the main cave. Visits are guided tours through the main chambers – Cango 1 and Van Zyl’s Hall. But if you want a real ‘caving’ experience a more extensive adventure tour involves crawling through small holes and little chambers, usually beyond your reach. To reach this cave, which is not famous for anything other than its accessibility (it is one of Cape Town’s favourite hikes, great for families as children can easily make the climb) and its feature on the landscape up on Constantiaberg (from almost anywhere on Tokai side of the peninsula you can look up and see the ‘eye’ in the elephant’s head on the hill) you hike from the Silvermine reservoir up the mountain. The hike is pleasant provided you do not start out in the midday summer heat. Take a picnic, sunscreen, a hat and good shoes. The views are spectacular. For one of the most dramatic ocean views from within a cave, visit Klipgat Cave in De Kelders, just next to Gansbaai in the Overberg. The best known of several caverns formed millions of years ago when underwater aquifers slowly eroded these spaces beneath the coastal cliffs, Klipgat Cave sheltered early humans for millions of years, and is one of the best examples of early human dwellings in the country. Back then the ocean was 5 km away, not just outside the opening. Klipgat Cave is the only freshwater cave along the coast of Africa. Today it is protected within the Walker Bay Nature Reserve and you can visit it on the 7km Klipgat trail, a hike from the harbour at Gansbaai along the shore. One of the easiest to reach caves on the Cape Peninsula, Peers Cave is famous for the 12 000 year old paleolithic skeletons (14 of them), evidence of Khoi-San habitation, uncovered here by Victor Peers and his son, Bertie, in 1927 that included an 11 000 year-old skull. Peers Cave is regarded as an ancient burial site and is known in some circles as the Great Mother Cave. Actually more of an overhang than a cave, it can shelter over 100 people from the elements. During the summer solstice the Sacred Site Foundation of Southern Africa hosts a ceremonial gathering in the cave. You can hike there from the Silvermine Nature Reserve on Ou Kaapse Weg or from Fish Hoek – look out for the signboard to Peers Cave (it is not an arduous hike at all, provided you stick to the path). Just above Peers Cave is a further cave known as the Cave of Ascension. The promontory south of Mossel Bay is known as Pinnacle Point. Here a series of caves have uncovered evidence that some of the Earth’s very first inhabitants lived in Mossel Bay. Now a Provincial Heritage Site the evidence of archaeological artefacts and other physical evidence has been very important in understanding how modern humans have evolved. Scientists believe that it was during the time of these artefacts that humans developed their modern intellectual capacity, behaviours that allowed them to travel to other places from Africa. Visit the caves as part of the Point of Human Origins Tour. 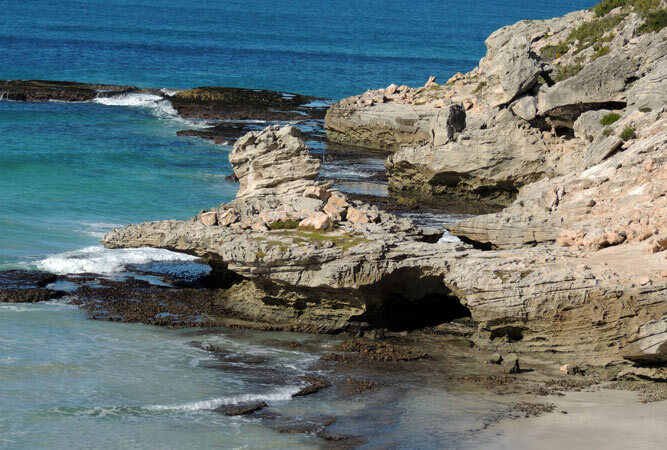 Also known as the Arniston Cave, Waenhuiskrans is a cavernous shoreline cave within the Waenhuiskrans Nature Reserve. Called Waenhuiskrans because there is room enough for a wagon and a full span of oxen to turn around inside, the excitement of a visit includes a walk along the coastline from Arniston, a climb down the cliffs and then a walk over the pebble strewn beach at low tide. The blue of the sea, and the views from inside the cave are spectacular. Wear the right shoes.